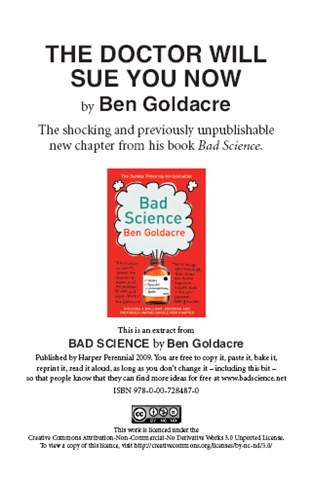 The Guardian's Dr Ben Goldacre has published a free and originally missing chapter from his recent book, Bad Science, an exposé on the bad science that infects policy and health in the UK. The chapter, "The Doctor Will Sue You Now", was originally cut from the printed edition because its subject, a vitamin salesman named Matthias Rath, tied Dr Goldacre up in £500 000 worth of litigation over its contents. 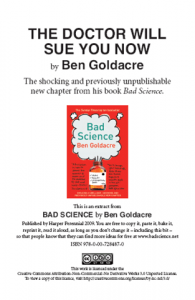 So what did Dr Goldacre have to say about Matthias Rath? He told the story of how Rath had convinced public officials in South Africa to abandon life-saving AIDS anti-retroviral drugs in favour of his vitamins and other natural products. If you're South African or have an interest in South Africa and/or HIV/AIDS, I bet this is starting to sound remarkably familiar. Hmmmm "garlic, lemon and African potatoes"? "The answer to the AIDS epidemic is here," he proclaimed. Anti-retroviral drugs were poisonous, and a conspiracy to kill patients and make money. "Stop AIDS Genocide by the Drugs Cartel said one headline. "Why should South Africans continue to be poisoned with AZT? There is a natural answer to AIDS." The answer came in the form of vitamin pills. "Multivitamin treatment is more effective than any toxic AIDS drug. Multivitamins cut the risk of developing AIDS in half." Rath's company ran clinics reflecting these ideas, and in 2005 he decided to run a trial of his vitamins in a township near Cape Town called Khayelitsha, giving his own formulation, VitaCell, to people with advanced AIDS. In 2008 this trial was declared illegal by the Cape High Court of South Africa. Although Rath says that none of his participants had been on anti-retroviral drugs, some relatives have given statements saying that they were, and were actively told to stop using them. Tragically, Matthias Rath had taken these ideas to exactly the right place. Thabo Mbeki, the President of South Africa at the time, was well known as an "AIDS dissident", and to international horror, while people died at the rate of one every two minutes in his country, he gave credence and support to the claims of a small band of campaigners who variously claim that AIDS does not exist, that it is not caused by HIV, that anti-retroviral medication does more harm than good, and so on. The whole chapter has been released under a Creative Commons license and is available to read online and download in PDF and Word Doc formats.